“I’ve always been for anything that would save,” says Gary Hoffman of Hoffman Farms, a 300+ head dairy with 800 acres just west of Chatfield, MN. Hoffman Farms recently saved energy and money on dairy technology through People’s Energy Cooperative energy savings rebates. Hoffman Farms first began with an on-farm energy audit in cooperation with Dairyland Power (wholesale power generator for People’s Energy Cooperative) to better understand the energy costs in their milk production and identify the most cost-effective technology upgrades. In the months following the energy audit, they met People’s Energy Cooperative Energy Advisor, Brandon Johnson, and started seeing rebate offerings for energy savings equipment in People’s Energy Cooperative’s Highline Highlights newsletter. The Hoffmans and Johnson worked together to define the kilowatt hour savings, complete paperwork, and calculate rebate amounts. “Brandon was really helpful. We got rebates for almost everything we upgraded, including efficient washers we bought months before the paperwork,” said Hoffman. 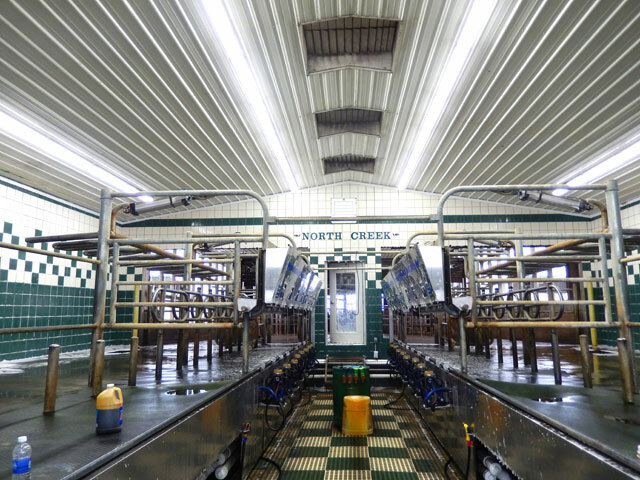 By placing a variable frequency drive on a 15 horsepower milk pump, the dairy is saving 25,590 kilowatt hours over a 4,000 hour annual runtime and $450 in energy rebates. 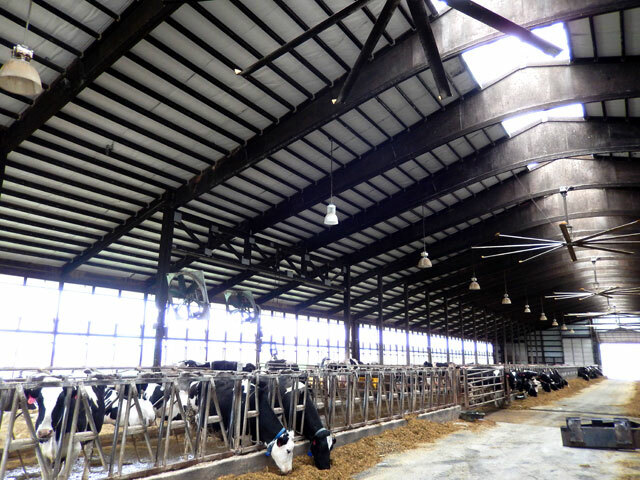 Switching their dairy parlor lights over to LEDs resulted in excellent savings as well: Changing 26 two-lamp fixtures from T-8 fluorescent bulbs to linear LED bulbs saved 3,333 kilowatt hours and $312 in energy rebates, and another 42 T-8 fluorescent bulbs in different fixtures to linear LEDs saved 1116 kilowatt hours and resulted in $168 in energy rebates. “We put the LEDs in back in November or December. The savings weren’t that great because we were switching out fluorescents, but we had so much trouble with the ballasts in the fluorescent lamps it was worth it. We got so tired of pulling out the ladder to replace the fluorescent lamps. So far, the LEDs have been an excellent deal. Anything that fails will be replaced with LEDs going forward,” said Hoffman. The Hoffmans use cloth towels for their dairy and upgraded with two ENERGY STAR clothes washers as part of the efficiency effort. “We figured we would save around 300,000 gallons of water per year with front load washers, and hot water on top of it. The savings in liquid propane, plus not having to waste all that water made sense,” Hoffman said. Besides the water and propane savings, the Hoffmans saved 263 kilowatt hours and $25 for each clothes washer in rebate money. To boot, their somatic cell count stays well under 100,000. People’s Energy Cooperative’s rebate program began in 1995. The Energy Rebate Program aims to keep energy rates low by managing energy demand at the consumer level and avoiding construction of new power plants that would otherwise increase electric rates for all cooperative members. For more information about dairy energy audits and agricultural rebates for your farm business, contact People’s Energy Cooperative at (507) 367-7000 or University of Minnesota Extension and Clean Energy Resource Teams at 612-626-1028.